Happy Halloween from the L train! Now the L is crowded like rush hour even at midnight. Yeah and you had to beg the cab driver to take you to BK. He is just on his way to school, or work, or his friends house or grandma's. 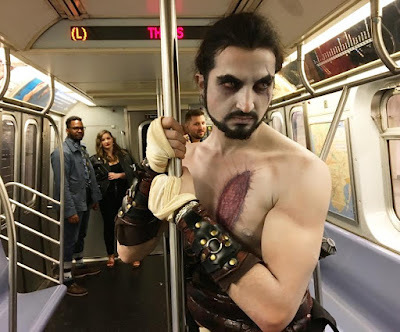 This guy must be from the underground version of the HBO hit show called Train of Thrones. The look of love -- on the L train -- which is pretty much everyday.